The U.S. military launched a search and rescue mission Thursday for the pilot of a Navy F/A-18C Hornet after his fighter jet went down during a bombing run over Iraq. There was no immediate word on the fate of the pilot. A U.S. Army Black Hawk helicopter went down in the same area Wednesday, but the military said hostile fire was likely not to blame. It was not clear how many soldiers were killed. Officials in Washington said Thursday that six soldiers died. But in a briefing, Brig. Gen. Vincent Brooks, the spokesman for the U.S. Central Command in Qatar, would not confirm reports there were six or seven people aboard the helicopter. "We believe there may have been some casualties," Brooks said. "We don't think it was a result of hostile fire." 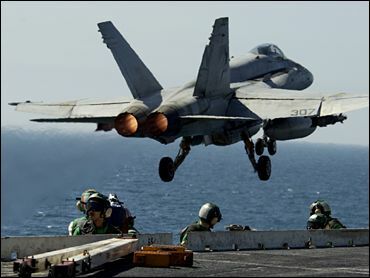 The cause of the Hornet crash was under investigation, but officials in Washington said it appeared likely that the single-seat plane was downed by Iraqi fire. If so, it would be the first American fighter jet shot down during the war, although the Iraqis have downed several unmanned surveillance drones. Mujahadeen near Basra have shown off what they say are the remains of a U.S. warplane. The Navy searched throughout the night, looking for the missing jet. "That aircraft does appear to have been hit by a missile, and that is a worrying development," said analyst Nick Cook of Jane's Defense Weekly. It's only one plane, but "we are hearing that there are increased reports of enemy surface-to-air missile activity. That is going to have to be counted very, very rapidly." Admiral John Kelly, who heads the three-carrier battle group in the Gulf, confirmed that coalition aircraft for the first time are encountering what appears to be guided missile attacks. He calls this the most dangerous phase of the war. With some 2,800 sorties flown since the start of the war, CBS News Correspondent Cynthia Bowers reports Navy officials point out privately the loss of only one plane in combat can be considered an extraordinary success story. The plane from the aircraft carrier USS Kitty Hawk in the Persian Gulf went down just before midnight Wednesday while on a bombing mission near Karbala, a city 50 miles south of Baghdad where fighting raged between U.S. forces and the Republican Guard. A search team was immediately launched. Other aircraft reported seeing surface-to-air missiles and anti-aircraft fire in the area where the plane disappeared, said Lt. Brook DeWalt, a spokesman for the Kitty Hawk. Brooks confirmed there had been missile fire in the area but said it was too early to say if the plane had been shot down. Iraqi television broadcast pictures Thursday of what it said was the wreckage and Iraqi Information Minister Mohammed Saeed Al-Sahaf claimed the aircraft was shot down by the Saddam Fedayeen, Iraq's paramilitary force. "We're now trying to exhaust them, making them more tired until our leadership decides the time and method to clean our territory of their desecration," he said. Navy and Marine pilots fly the F/A-18 from aircraft carriers. The supersonic jets are armed with a 20mm cannon and can carry a wide range of bombs and missiles. The easily maneuverable Hornet can operate as a fighter jet, shooting down enemy planes, or as an attack plane, bombing enemy targets.